We’ll be taking a drive through the NE Vancouver area, arriving at the Pomeroy Living History Farm in Yacolt, at 10 a.m. There we’ll lots to see and do. You will be free to wander, test, try, tour, and enjoy while there. You’ll find hands-on activities for adults and children, demonstrations, information, plants etc. for sale, local artisan vendors, as well as touring historic buildings on the property. For those who wish, there’s a short walk to a winery for wine tasting or just a look-see. The Faire is an annual event held the last weekend in April. They are excited about our old cars and will try to get us all parked together. It will be April, so come prepared for whatever the skies decide for us that day. However, there are many undercover and indoor areas to wander in the case of rain. So far, weather has been mostly favorable. We’ll leave around noon. They are open until 4 p.m. if you wish to return after lunch. NOTE: Farm accepts credit cards for purchases, but vendors ONLY deal in CASH, so you might some in case you find something you want from a vendor. The day ends with a hearty lunch at Nick’s Restaurant Bar and Grill in Amboy. It’s a popular place with great food in good quantity. >> Contact DAVID KOETJE (503) 667‐3959 to schedule your CRR duty slots. 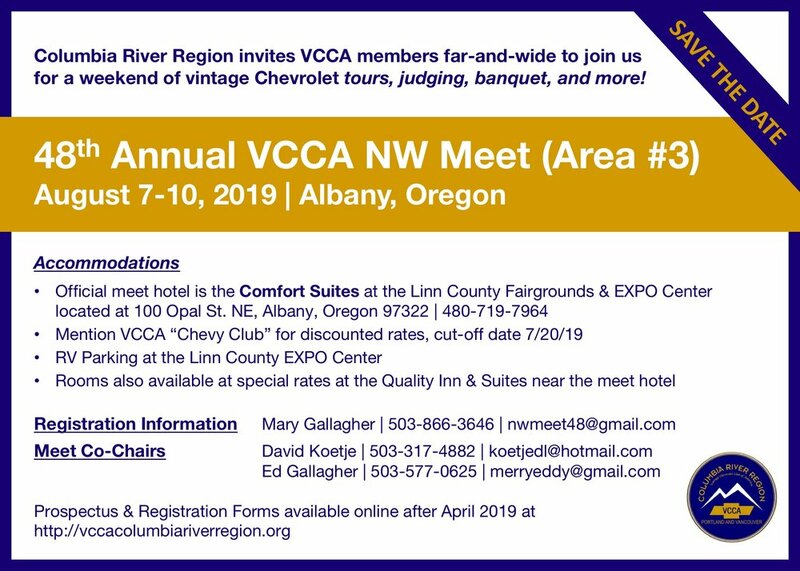 See our 2019 Portland Swap Meet page for more info here. Have you ever dined or wanted to enjoy a meal in an authentic railroad dining car? Well, now’s your chance to experience a part of how train travelers have been dining onboard since these cars came into service, but with a bit of a twist. Join this tour and you’ll enjoy your choice of a delicious Ingallina’s box lunch in a 1941 Restored Pullman Dining Car at the Oregon Rail Heritage Foundation Museum in Portland. It will be a fun and interesting tour that includes a nice drive, a tour of the museum, train history, and a guided tour by those working on the restoration projects, where we can even choose to board some of the cars in progress. The tour will be dotted with interesting information from those involved in their restoration. Even your tour leader, Warren, has years of experience with trains. The museum plans to make some flyers and advertise that some old Chevys will be there to come and view, So, if at all possible, consider driving a vintage car or hitching a ride with a fellow CRR friend who brings their vintage Chevy. Our members’ cars make a beautiful display. There will be a special place to park our old cars and handicapped parking is available. >> Lunch follows in the restored dining car after touring. Social Hour 5 p.m., Dinner 6 p.m. The 1943 play highlights the 75th anniversary of events playing out in WWII. This year’s show features the story of Sgt. Kenny Saito, a young Japanese-American who left his family at the Minidoka internment camp to serve his country in the Army. Audiences will also hear the stories of Evelyn, a young war bride who became a mother while her husband was away, a zealous ration board officer who experiences his own “Casablanca”, and two young soldiers who have returned from their first mission with the 10th Mountain Division. It’s time again to go visit the Ings and pick some fruit. As always, we will try to vary the mechanics of the trip to make it more interesting. By vote, it was decided to take the long way around Mt Hood and approach from the South. We will meet at the Troutdale Outlet Mall at 9:30, on Saturday the 6th of October. You may depart at any time after 9:30 on your own. YOU WILL NOT RECEIVE ANY SPECIFIC written ROUTE INSTRUCTIONS. Basically you will drive south to HWY 26, Turn left, (east), and follows 26 to 35, turn north and follow 35 to Hood River and gather at the County Museum, located just west of the entrance to the Hood River Bridge. We will travel as a group to the Packing Plant at Bingen where Ed will give us a tour and tell about the recent fire. After the tour you will be led up the steep hill to Ed and Melissa’s house for lunch (probably pulled pork fixed by Melissa) followed by fruit picking and fellowship. Be sure you bring your 2 cubic ft box to carry away the loot. A chair would be a nice item to bring also. This will conclude the Apple Core Tour 2018. Meet at 9:30 am at Peterkort Towne Square (11070 SW Barnes Rd Portland, OR 97225) in the lot near the Orchard Supply Hardware store. Center is located north of US Highway 26 at Cedar Hills Blvd and Barnes Rd intersection. Store restrooms will be open, and there is a convenient bagel shop for those who want coffee, tea, etc. Leave at 10:00 am for a 45 mile drive on (paved) back roads. Salad and sandwich buffet at Prime Time restaurant (4450 Pacific Ave, Forest Grove, OR 97116). Then drive 25 miles back to starting point, or leave on your own. Columbia River Region monthly member meeting. Meet at the Troutdale Outlet Mall @ 9:30am to tour out together, or arrive directly at the Koetje's at 11am. We will drive through the country and up the mountain to the end of the paved road. Then there will be 3 miles of natural earth road. Drive the vehicle of choice that you don’t mind having to clean up afterwards. 2018 NW Mini-Meet "Hooray for Hollywood"
“Hooray for Hollywood” is the theme for next summer’s NW Meeting in Chehalis, WA. The planning process has been somewhat fluid but we are finally beginning to pin down the major events. The Holiday Inn Express will be the "Meet Hotel" -- (360) 740-1800. Ask for VCCA rooms when booking -- 26 rooms have already been spoken for. Previous announcements have put the judging at Thursday a.m. but that has changed to Thursday afternoon 1:00 pm). Some folks will be able to drive to Chehalis that morning, saving an overnight at the hotel. There will be a selection of tours, the Barn Banquet is on Friday p.m. Saturday is the main event, “Hooray for Hollywood”. Our team is working to provide a registration packet by the first week in January. The dance orchestra, known as the Café Society, is practicing. >> Please address questions to David Gowan. Meet-Up: 9 a.m. at Clark County PUD (Vancouver Exit 1C off I-5) for coffee, tea and goodies. Leave at 9:30 for a fabulous countryside drive with a stop for a car-oriented demonstration and other places of interest. Then we’ll relax and visit over a hearty lunch for the Gents @ The Sportsman and Miz Myrtle’s Tea at Myrtle’s Teahouse for the Ladies. Ladies: Wear your tea hats, frills and finery if you please. >> The first group will meet at the Puppet Museum at 9:45am. (9:30am for those who are arriving late.) The door closes at 10:00am, as the showing is in a small room and the door will disrupt the show. The museum is in a neighborhood. Parking is on the street. You may have to park a block or two away so arrive early. The showing ends at 11:30am to allow for some questions. We will proceed to East Moreland Golf Course for lunch and meet up with second group. >> The second group will head straight to East Moreland Golf Course by noon for lunch. After lunch, they will proceed to the Puppet Museum for the showing at 1:30pm. Even though February is early in the year, we will be having a drive before we enjoy our afternoon of activities. To encourage all of you to get out the vintage CARS, we will be having the “old CAR drawing”. Depending on how many vintage CARS attend we may even have more than one! The tour will be 30 miles long. We will be driving to the Grotto Convention Center passing through some interesting neighborhoods. It will be a city route, but we have done our best to avoid traffic lights so that we will be able to keep together. Most of us have Columbia River Region shirts of some kind, but I would bet most of us have shirts, jackets or hats from other CAR events we have attended. I am asking that we wear those instead. They can be from another tour we attended, or better yet from a CAR event such as a race, a museum, a cruise in or even an In-N-Out Burger. It will be a blast seeing where some of you have been throughout the USA and even the world in the pursuit of having fun with your CARS! Don’t worry about it even you don’t have a different shirt, wear whatever you have. Just come and have some fun. I know some of you have collections of vintage CARS, but even those of us with just one vintage CAR probably collect something else. So I am asking you to share your collection. We will have tables set up to display them so all can enjoy looking at them. They don’t even have to be CAR related, just bring them! Please limit the size of what you bring to a 2 foot by 2 foot area or about what will fit in a shopping bag. After time to look at the displays and visiting, we will have a game to test your knowledge of music about CARS. So the next time you listen to music on a CAR radio or at home and it has something to do with CARS give it a little more attention than usual. We also will have a 16-minute movie entitled “Inspiration for CARS”. I’m sure you will find it both funny and entertaining. There will be recorded music with what else but a CARS theme. Who knows what else I will come up with before then. Most of all, there will be time for chatting with friends, old and new. Lastly, dinner will be a Greek inspired buffet style meal and will include a beverage and dessert. For those of you who attended our tour here a few years ago, you know the Chef comes up with some delicious food. Meet at Lowe’s parking lot at 1160 N Hayden Meadows @ 1:15 PM. Leave Lowes at 1:30 PM promptly. Don’t be late! Set up displays and visit. Coffee, tea and water available. Dessert and more time to visit after dinner. >> Reservation DEADLINE: Get it to Bonnie Clark no later than the FEBRUARY 6th Club Meeting.